US server manufacturer Supermicro has told customers that it is reviewing its hardware for any evidence of Chinese spy chips, after a contentious report earlier this month. Bloomberg claims that the Chinese government was able to infiltrate the company's supply chain, adding tiny chips that ended up inside AWS and Apple data centers. All the companies involved have aggressively denied the claims, but the report sent Supermicro shares crashing - after publication, the company's share price halved, although it has grown slightly since. “Despite the lack of any proof that a malicious hardware chip exists, we are undertaking a complicated and time-consuming review to further address the article,” Supermicro said in a letter to its customers, viewable on the SEC's website. "We trust you appreciate the difficulty of proving that something did not happen, even though the reporters have produced no affected motherboard or any such malicious hardware chip. As we have said firmly, no one has shown us a motherboard containing any unauthorized hardware chip, we are not aware of any such unauthorized chip, and no government agency has alerted us to the existence of any unauthorized chip." Supermicro is not alone in its denials. It is joined by Apple, which wrote to the United States Congress to dispute the allegation. “There is no truth in their story about Apple,” the company's CEO Tim Cook told BuzzFeed News. "They need to do that right thing and retract it." Replying to a tweet regarding Cook's statement, Amazon Web Services CEO Andy Jassy echoed the sentiment: "Tim Cook is right. Bloomberg story is wrong about Amazon, too. They offered no proof, story kept changing, and showed no interest in our answers unless we could validate their theories. Reporters got played or took liberties. Bloomberg should retract." 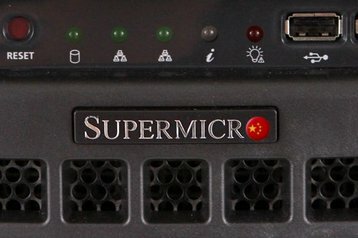 "Supermicro is committed to making world-class servers and storage products. Bloomberg's recent story has created unwarranted confusion and concern for our customers, and has caused our customers, and us, harm," Charles J Liang, CEO of Supermicro, said in a statement to CNBC. "Bloomberg should act responsibly and retract its unsupported allegations that malicious hardware components were implanted on our motherboards during the manufacturing process. The allegations imply there are a large number of affected motherboards. Bloomberg has not produced a single affected motherboard, we have seen no malicious hardware components in our products, no government agency has contacted us about malicious hardware components, and no customer has reported finding any malicious hardware components, either." Bloomberg has remained committed to its controversial article, saying that it is "the result of more than a year of reporting, during which we conducted more than 100 interviews. Seventeen individual sources, including government officials and insiders at the companies, confirmed the manipulation of hardware and other elements of the attacks."